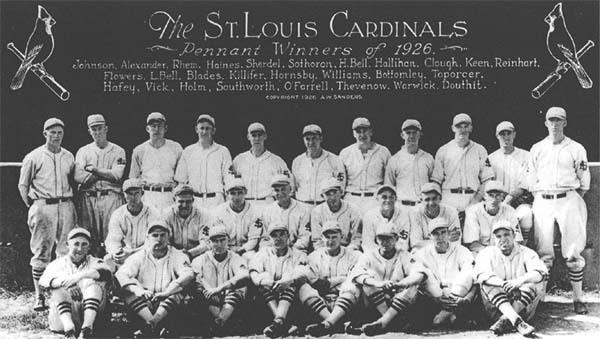 Although Rogers Horsby had never finished higher than third place after eleven years with the Redbirds, the player-manager informed his team that they "had no room on our club for second-division ballplayers." Two key June acquisitions turned the club's fortunes: getting veteran outfielder Billy Southworth from the Giants in what manager John McGraw later termed the worst trade of his career, and picking up Grover Cleveland Alexander from the Cubs, who became the Card's best pitcher in the second half. Still crafty with a decent fastball and wicked curve, Alexander would play an unforgettable role in the 1926 World Series.